The G20 financial meeting in Moscow on July 19-20 focused on economic growth, unemployment rates and tax evasion by multinational companies. Russia, playing host for the event, was placed in the position of arbiter between emerging and developed countries. At a meeting in Moscow on July 19–20, G20 finance ministers and central bank governors agreed on a number of priorities, prior to the G20 summit in St. Petersburg that is scheduled for early September. The issues included dealing with weak economic growth, high unemployment, a lack of long-term investment, tax evasion by multinational companies, exchange rate manipulation, etc. The ministers were especially concerned about a continued recession in the eurozone and a slower pace of growth in most economies. “The global economy remains too weak, and its recovery is still fragile and uneven. Unemployment remains excessively high in many countries,” the ministers stated in a communiqué adopted after the meeting. However, in contrast to statements made at previous meetings, calls for budget consolidation, or a reduction of deficits and public debt, sounded much more subdued in Moscow. As recently as three months ago, European countries were calling for strict debt level targets, demanding a uniform debt reduction goal of 90 percent of GDP. That proposal did not pass this time around, and the ministers failed to agree on any specific debt level targets. The G20 countries did not assume any responsibility for slashing their budget deficits or cutting public debts by 2016. According to the French minister of the economy and finance, Pierre Moscovici, getting public finances back on track is a “medium-term” task. In the short term, stimulating economic growth remains the top priority. After assuming the G20 presidency, Russia announced that financing for investments as a main way to stimulate the growth of national economies would be a key priority for 2013. The communiqué put this theme into perspective, as the ministers reiterated the importance of investment in infrastructure. In particular, Russia is planning to unseal its National Welfare Fund, in order to invest 450 billion rubles (around $13.9 billion) in infrastructure projects. Another reserve that should help countries improve their economic situation is a modernization of the tax system across the G20, rather than in individual nations. The governments intend to close loopholes used by multinational companies to evade taxes — a practice that costs them hundreds of billions of euros every year. To this end, the Organization for Economic Cooperation and Development (OECD) has proposed establishing international tax rules in about two years from now, to prevent tax base erosion and profit shifting. Implementation of these initiatives will become the biggest reform of the global taxation system to be undertaken since the 1920s, OECD Secretary General José Ángel Gurría said in Moscow. The 15-point action plan will help countries develop tax evasion prevention standards. It involves the elimination of legislative differences in the taxation systems of various countries, as well as the so-called tax havens. Still, it does not impose uniform tax rates. The OECD has proposed changes to its Model Tax Convention, to prevent double non-taxation. According to José Ángel Gurría, there are more than 4,000 bilateral tax treaties currently in effect. The convention would cover this, rather than re-negotiating all the treaties. It has also been proposed that automatic tax information exchanges be implemented; these are currently performed mostly on a bilateral basis, as well. “We discussed the OECD Action Plan on fighting tax evasion by multinational companies,” Russian Finance Minister Anton Siluanov said after the G20 meeting of finance ministers. The Russian minister adding that the meeting participants would recommend the G20 leaders approve the plan at the St. Petersburg summit. How can Russia best use its G20 presidency? Russia chairs G20 finance ministers’ meeting in D.C. The minister explained that multinational companies currently evade taxes both in the country where their production facilities are located and in the country of incorporation of their profit center. 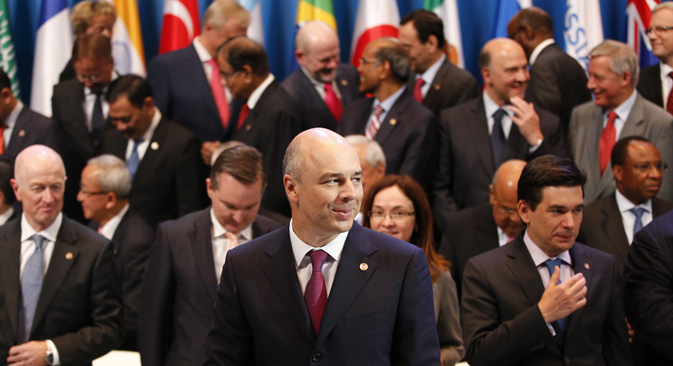 Another G20 initiative concerns abandoning exchange rate manipulation. Faced with an economic downturn, all countries have tended to more or less weaken their own currencies in order to support domestic manufacturers. For example, Japan let the yen drop 20 percent this past spring, without earning condemnation from its G20 peers. The ministers spoke of this rather obliquely in Moscow, as they agreed to conduct a coordinated quantitative easing policy — i.e., to notify each other in advance before pumping liquidity into their respective economies. Overall, the financial G20 meeting in Moscow approved a record number of action plans on taxes, investment and financial regulation. It also promised to develop a comprehensive St. Petersburg Action Plan for the September summit, which should both summarize the results of Russia’s G20 presidency and set new targets for the club of leading nations.